WINSTON AIR™ fly rods represent the very best in fly rod design after more than 88 years of rodmaking. They feature a quick flex and recovery through the casting stroke without feeling stiff to make sure you enjoy every cast. This revolutionary fly rod design features Winston’s new SuperSilica™ resin system with high modulus Boron graphite. This allows significantly less weight, more liveliness and higher responsiveness for optimum presentation. 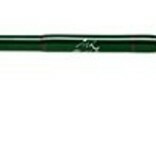 These rods have the broadest casting range of any fly rods we have ever designed.